The starry background was too irregular, the new ships’ camouflage too surreally effective, to let him discern their shapes, but that didn’t matter. Raiders would use any ship they could get their hands on. Conor Powers-Smith’s work has appeared in Abyss & Apex, Fantastic Frontiers, Daily Science Fiction, Nature, and other publications. McCray was smearing sealant liberally around the edges of the loose panel near the port aft airlock when the circular yellow lights lining the outer hull every twenty meters flashed off all at once, flashed back on a moment later a deep, urgent red, and began to pulse. He let go of the canister of sealant, which drifted off and disappeared from the limited range of vision afforded by the spacesuit’s helmet. He reached for the keypad at his hip, switching power from the electromagnets in the toes of his boots to those in the soles. He leaned back, boots gripping the hull, and stood upright. Then he started back toward the airlock. His right hand hovered over the keypad, his first and middle fingers alternately activating and deactivating each boot’s magnet, allowing him to move along the hull in long, regular strides. He had to do it blind, since the bulk and inflexibility of the suit kept him from seeing the keypad, let alone his own feet. But more than four decades in space had made him a practised hand at this kind of movement, even if he had precious little else to show for it. As he moved, he scanned the small slice of space that made up his range of vision, not expecting to see the cause of the disturbance, but seeing it almost immediately nonetheless. Up ahead, whole swaths of stars were moving. Space itself seemed to be oozing across its own surface, like new lava flowing over old. The starry background was too irregular, the new ships’ camouflage too surreally effective, to let him discern their shapes, but that didn’t matter. Raiders would use any ship they could get their hands on. The only common denominator was their camouflage: windows tinted to invisibility, running lights deactivated or simply smashed, hulls painted dead black, except for the pinpoints of white masquerading as stars. He hoped Captain Tanner would be sensible, offer only token resistance before consenting to be boarded. McCray had raised mugs with more than a few raiders, in spacer dives on Earth, Mars, Europa; they weren’t the bloodthirsty savages depicted in films and games, but simply rough people in a dangerous, lucrative trade. They’d leave the crew alone, as long as they got the cargo, which was bound to be insured anyway. But the Bastion was a fast hauler when she was right, and corporate didn’t look favourably on captains who surrendered their cargoes too readily. Tanner would run. Instinctively, McCray tried to speed up and lost his rhythm, wrenching something in his left leg trying to raise a boot that was still locked down. That was when the first shot came, a blue-green artificial comet hurtling in from the void. It was a clean miss, far ahead toward the bow. Another shot, another miss, but closer to the mark. Then all cannons were firing, and space was lined with sickly blue-green veins. He felt hits, vibrating up through the hull into his boots, his legs, his spine. Shots were slamming home, each carrying an electromagnetic disrupter which rendered the Bastion’s shields temporarily useless a split-second before impact. He never saw the shot that did it, only felt it, and only indirectly. It wasn’t a concussion, but the opposite of one. Whatever force it carried he experienced as a negative quantity, the hull not heaving beneath him, but disappearing. Though it wasn’t the weapon’s purpose, no device could’ve been better designed to dislodge a man pinned magnetically to the hull of a ship. The disrupter pulse temporarily shut down his suit’s systems, switching off the magnets in his boots just as the massive kinetic energy of the projectile shoved the ship minutely off course. He was flung from the ship like a shed hair from a shaking dog. For the first few seconds there was nothing, not even panic. Then there was panic. He had no air. He struggled to breathe, and failed. Then there was nothing. When he came to, his first thought was that he was breathing. It took him a moment to recall why that was noteworthy. Then he remembered and the panic returned. He was adrift. The ship was gone. He was a dead man. But not yet. There was relative firmness of footing in that. The suit hadn’t been breached, its systems hadn’t been permanently damaged, or he’d be dead already. He raised his left arm as high as he could, craned his neck down as far as the suit allowed. He flipped up the panel on the suit’s forearm, and saw that the amber screen of his indicator was alight and functioning. He’d been out for nearly three hours. Three hours of air wasted. Three hours less time to figure a way out of this mess. But McCray had to acknowledge that he wasn’t getting out of this. Even if he were smack in the middle of the main cargo lane to the asteroids, that lane was fifty million kilometers wide. Even a ship that had been trailing the Bastion so closely as to be in danger of ramming her wouldn’t have had one chance in a million of spotting him, either by sight or instrumentation. And there was no telling how far he’d drifted. There was no sense of motion, in the absence of any reference point. He was as lost and alone as any man had ever been. He stared hard at his indicator, desperate for a distraction. He saw that his left boot was still magnetized, still seeking, with blind, electronic idiocy, to fulfill its purpose. He moved to shut it off, but stopped himself. The suit had plenty of power; its oxygen supply would run out long before its batteries. And the allegory of the boot might make a useful mental bludgeon, if he lapsed into false hope again. For some time he stared at the stars, drawing shapes and patterns from their random spray. There was a snake, there a dog, there a running man. Running, no doubt, from some inescapable fate. The shapes grew stranger and less defined, until he found things for which there were no names. Finally they made no pattern at all, or only one, the patternless chaos of their true distribution. Even that, he thought, was an illusion, those stars that seemed so near each other separated by vast tracts of emptiness. He woke, frightened. He had no memory of being near sleep. Oxygen toxicity. He should’ve anticipated it. Prolonged exposure to the suit’s highly pressurized supply of O2 could be expected to cause myopia, confusion, sudden loss of consciousness, seizures, death. It would be a race, he saw, between oxygen and its absence. If the suit’s supply ran out, he would suffocate. If it held up, seizures of increasing strength, followed by embolism, stroke, heart attack; something painful and terrifying, anyway. He considered venting his remaining air, but was pained to find the hope there still. He thought of his boot and found he had no objection to identifying himself with it. It had been made to seek magnetic contact, and it was doing its best to fulfill its purpose. He woke again with what he thought was a start, but he didn’t stop shaking immediately, couldn’t stop the tremors cascading through his muscles. It went on for some seconds. Even after it seemed to have stopped, isolated muscles in his leg or arm or neck continued to go through sudden, savage spasms. His vision had noticeably blurred; the stars were no longer so sharp, and when he raised his indicator, its screen was almost illegible. He squinted to read the time. Nearly sixteen hours had passed. He stared at the stars, nostalgic for the time when they’d formed pictures for him. They refused to do it now. Soon. Minutes or hours. Then, oblivion. Even now, drowsy and vague and confused from what the O2 was doing to his brain, he found he could still feel fear, in all its sharpness. A patch of darkness began to grow in the centre of his vision. Was hallucination a symptom? He couldn’t remember. Possibly he was beginning to go blind. Perhaps this was what it was like, at the end. He couldn’t judge its size or proximity. It was like a negative of the constellations he’d seen earlier, its outline every bit as vague and mutable. Was his focus slipping so rapidly, or was the shape really moving? Was he forcing patterns onto it, as he’d done with the stars, or was it really shaped like a man? If he wished, he could see legs moving slowly, rhythmically, an arm swaying at its side. Then it was Death, coming to claim him. 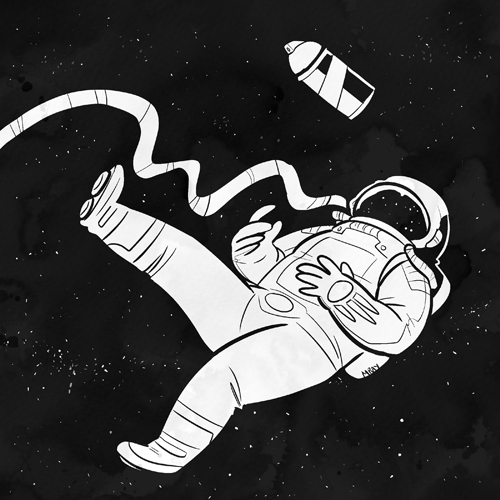 Did Death wear a spacesuit? The bulkiness, the exaggerated roundness of the head, were unmistakable. Then all at once the universe was only light, bathing him and burning his eyes, unimaginably bright, unimaginable at all, here in the void. Next came deafening sound. It came to him in a confused flash that dying must feel much like being born. There was a peal of hearty laughter. Though it hurt his ears and seemed to be at his expense, it cheered McCray immensely. It seemed the first real part of this baffling encounter. The man opened a panel in his belt and began drawing out a thin line, which McCray recognized as a tether. The man reached toward him again, found the small hook on McCray’s belt, and attached the line. He started to turn, then checked himself. “Whoops. That’s a good way to get a hernia,” the man said cryptically. He reached toward McCray’s keypad again, and pressed another button. McCray began to rise, or the man to descend. The line tightened, and the man turned and moved off, walking, to all appearances, along a flat, invisible section of space itself. McCray watched him from a few feet above, where he floated like a child’s balloon. It wasn’t until he saw the man’s boot come down half on and half off a star that McCray’s mind suddenly shifted, and took in the true situation. The boot. For some weeks he was a sort of ship’s mascot, the joke being that they would stick him back on the hull, this time right forward at the bow, and make him their figurehead. The ship, which was called the Spider, would be rechristened the Rescued Man. The plan was endlessly amusing to the raiders and, once he decided it was indeed a joke, to McCray as well. The ship’s navigator worked out some equations purporting to show the probability of a man being blasted off the hull of one ship and onto that of another, some kilometers distant. These McCray found less funny. Finally they dropped him off on Mars, where he caught the first transport to Earth, where in turn he remained for some time.